Cake Decorations for our 14th Wedding Anniversary. I have been married for 13 yrs going on 14 yrs and I want to make my own Wedding Anniversary Cake. I have a cake that has hearts and flowers. I am having trouble making the flowers. Is there an easier way to make them? Please help. I am doing party next year in August. I have time but I am practicing now. Hi Belinda, Congratulations on your 14 years of marriage coming up. What kind of flowers are you trying to make? Are they buttercream roses, fondant flowers or gumpaste flowers? Can you send me a photo of the cake you are trying to make? You have lots of practice time. You can always opt for fresh flowers or even silk. Until I see a photo or you can tell me what medium you are working with, I am not sure how much help I can be to you. Here is a brand new page at the website with lots of examples of fondant and gumpaste flowers. Wedding Anniversary Cakes on this site. Some of the links on this page are affiliates. This means that I will receive a small commission if you purchase a product through them. There are no extra charges for doing so. This helps me keep the information on this website free of charge. Because my name is attached and your satisfaction is very important to me, I only recommend products I have purchased or would purchase myself and which I believe you would benefit from. I am using fondant. I tried buttercream and had trouble with both. Which one do you think is easy to do work with. The cake I want to make can be found on istockphoto.com. It is made of hearts stacked side by side and using pillars. Once you learn to use fondant it may actually be easier than buttercream to work with. I would suggest that you take a look at the flower making books at Candyland Crafts. 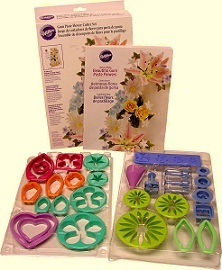 I own and use the Wilton Beautiful Gum Paste Flowers Floral Flower Making Set. It has very detailed instructions and clear step by step photos. The book does suggest Gum paste but I have made the flowers with fondant. It comes with everything you need to make a variety of flowers. Have fun and I will look forward to your photo of the finished cake. Happy Anniversary! I have a video at my YouTube channel with instructions for making fondant roses.